Last edited by walkingupstream; 01-07-09 at 10:28 AM. want a +/-6 deg +/-6 deg 130-140mm stem FSA, ritchey, etc. of comparable cost. Last edited by Nimitz87; 01-29-09 at 03:26 AM. or another quality stem with similar dimensions. Desperately need a 1 1/4" quill stem, 110-120mm (possibly 130mm), zero or negative rise. This is for an older Cannondale Road bike with the Sub-1 Fork. I do have some old Cinelli stems 1" quill 100-120mm available for trade. I'm looking for a nice asjustable 1" stem with a 7/8" handlebar clamp diameter. Last edited by Jawn P; 03-03-09 at 09:23 PM. Thomson road stem, 90-100mm 26 or 31.8 clamp. 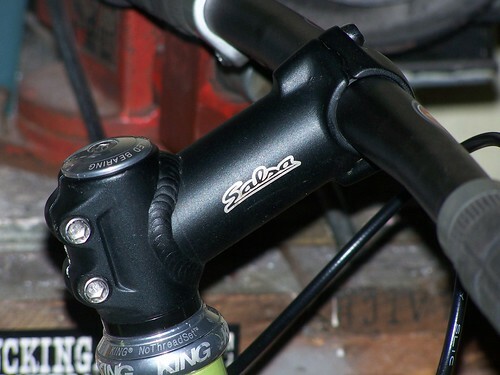 or any other black road stem in same length, Ritchey 4axis? 3T Pro? Let me know what you have. Bontrager race lite 120mm, 17 degree, 31.8 handlebar and 1.125 mount. Similar 90-100mm 17 degree 31.8 or 26 handlebar with 1.125 mount. 3T Forgie +/-10 degree, 31.8 clamp, 110mm. A 17 degree, 25.4 clamp, 130mm stem. profile BOA, threadless 1 1/8", 140mm, 25.4 clamp (two bolt), silver, 10deg(?). generic alloy, threadless 1", 110mm, 26.0 clamp (four bolt), silver, 6deg(?). nitto technomic, quill, 1", 60mm, 25.4 clamp (one bolt), silver, 17deg. anything 1" or 1 1/8" threadless, 70-90mm length, 26.0 clamp (open face bolt design), slight or no rise, prefer silver but black okay. how much did you want for the 26.0 deda stem? Want: Same thing but shorter. Brand new Thomson Elite -- Silver, 130mm, 26.0 clamp, +/- 5 deg, 1 1/8"